My name is Grig Richters. I am a German filmmaker and I am marching from Paris to Berlin in solidarity with refugees. I am asking the EU Governments to give asylum to the children who are currently stuck in refugee camps on EU soil, especially Camp Moria in Greece. The situation is so dire that many of those children are trying to commit suicide. I want to set up an emergency fund for these children and your donation will help make this happen! You might like to read this Euronews article about my initiative. 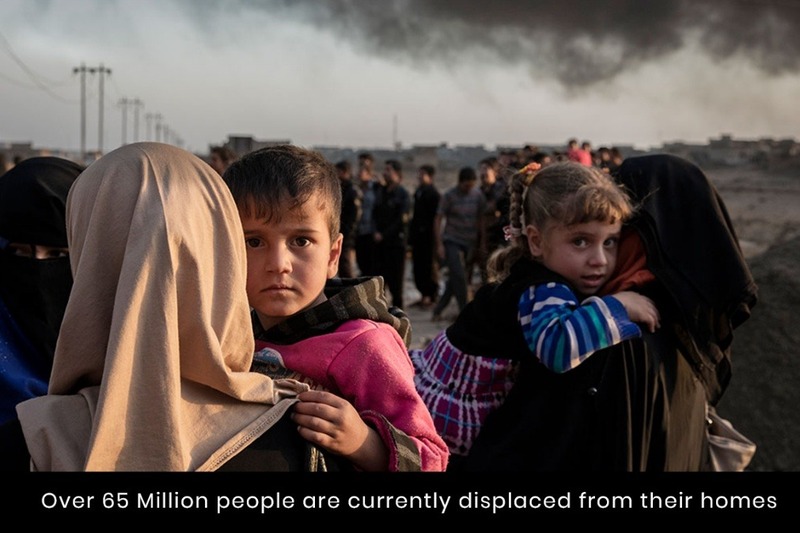 According to the United Nations Refugee Agency, "an unprecedented 68.5 million people around the world have been forced from their homes. Among them are nearly 25.4 million refugees, over half of whom are under the age of 18." Read more about my initiative in English (here), German (here) or French (here). I am marching from Paris to Berlin - nearly 1.3 Million steps. I am not a professional runner so I am counting on your support to help me march this distance. We need to show the world that we care about one another, and that we do not tolerate hate and what better way to show this than to march in peace between two of Europe’s historical capitals? 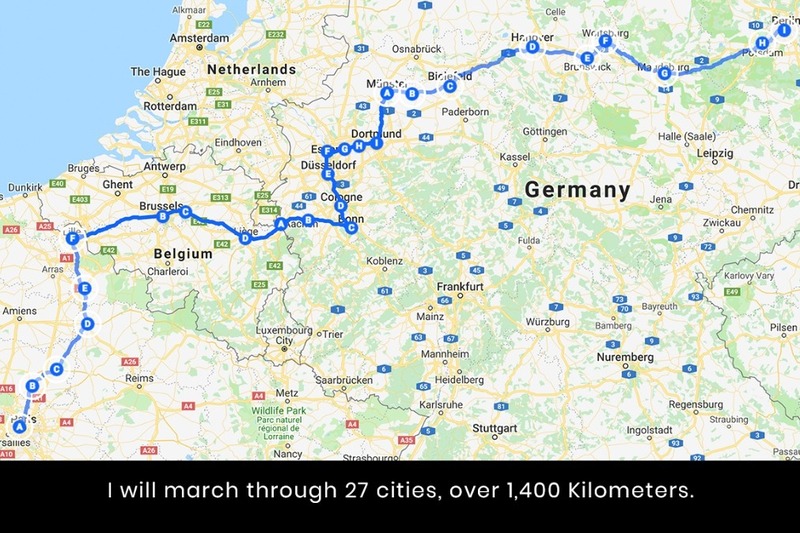 I will march around 1,400 KMs, via Brussels, Cologne and Hanover. You can view the full route, here. There are currently around one thousand unaccompanied children stuck in refugee camps on EU soil. Many of the children are stuck in Camp Moria, Greece, and are trying to commit suicide as this powerful BBC video (below) shows. I want the EU Governments to give them a chance at a normal life and give them a new home. One of the children that I have been supporting is Majid Sharifi. He is 17 years old and came to Europe aged 15 by himself. The only family he has is his older brother who has asylum in Germany but the German Government refused the family reunification due to formalities. He has been raped and tortured and currently lives on the streets in Athens, Greece. Read about him, here. 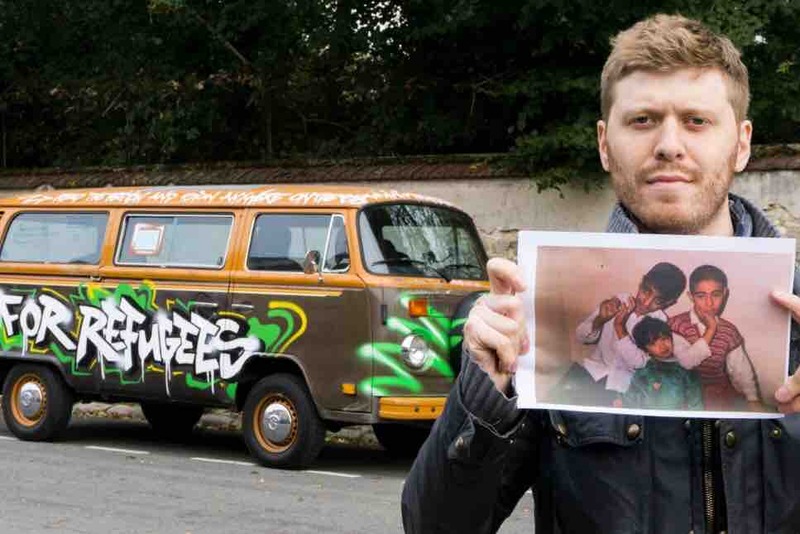 You can also read this Spiegel article about him (German only). I want to raise money for these children. To help them kickstart their lives. I am also going to need money for food and cheap accommodation for my travels but I won‘t spend more than €1,500 of the money raised. All the rest will go directly to the children. Dr. Brian May and I co-wrote the Petition which has already been signed by numerous people including Dame Judi Dench and Olympic Swimmer Yusra Mardini. You can sign it here to ask the Governments to save the refugee children. Thank you for taking the time to read about my campaign. I would be very honoured if you decided to donate to my initiative! You can also connect with me here: Facebook , Twitter , Instagram , LinkedIn .